Do you want to relish a coffeehouse-style coffee in your comfort zone? If your answer is “yes,” then the Breville ESP8XL Café Roma will be an ideal option for you. Today, I’ll discuss breville cafe roma review to make you familiar with an amazing coffee maker. So, let’s get started! The incredibly-designed Breville ESP8XL Café Roma provides a budget-friendly alternative to high-end Breville espresso makers but with the same mind-blowing taste. This stainless steel coffee maker is featured with a unique 15-bar pump plus a dual water filtering system that’s absolutely perfect for froth and crema. A cup-warming plate has also come with this machine. Now, let’s discuss the top-notch features of this coffee maker that offers flavor and convenience alike. I’ll try to explain the features and functionalities of Breville ESP8XL Café Roma and it will help you in making a wise purchasing decision. 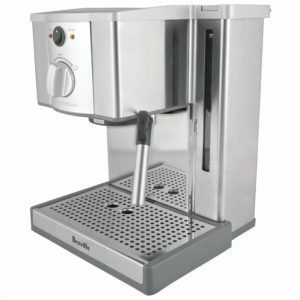 Breville ESP8XL Café Roma is manufactured with Stainless steel for which it has got an attractive yet unique appearance. Its steel rod plus froth enhancer provides the facility of best milk frothing. This coffee machine has come with 15 bar pump system along with the Thermo-block system for the perfect temperature. As a result, you’d get the finest Espresso drinks. Having the dimension of 23 x 30 x 24 cm and weight of around 7.5 Kg, you can easily place this coffee maker in your kitchens. This machine is featured with a big 1-litre water tank along with an external water window for indicating the lower water level. If you need superb frothing using milk, you have to use the rod but the tip should be unharmed. After making your Espresso, you can slide off the tip. Owing to its dual wall filter, you can make the heart-warming cream. Its warming tray can heat up to 6 Espresso cups. Another best part is that assembling and maintenance of Breville ESP8XL Café Roma are superbly easy. You can prepare three different types of drinks using this coffee maker within seconds. This machine has the ability to froth the milk in a great way. Actually, it is giving a tough competition to other coffee machines due to its unmatched output. The aforementioned features of this coffee machine have made it make a prominent presence among its competitors. Breville ESP8XL Café Roma actually holds everything to make a delicious espresso apart from the grinds. You’d also get a frother jug and two stainless steel espresso cups that mean more convenience. If you place the cup atop the machine, the cups will start heating up as you start pouring water into the water container. You’d be capable of seeing the level of water on the side of this coffee maker and that’s without taking it apart in the procedure. With the help of the light indicators, you’ll realize when the machine is getting prepared and ready for brewing your coffee. After snapping the filter in the particular place, you could quickly able to initiate the brewing process. You just have to add in your grinds and turn on the dial on the front part of the respective machine to espresso. After brewing, you’ll get a beautiful crema on the top of your espresso. Breville ESP8XL Café Roma has come with an amazing frother that enables the users to prepare microfoam and froth, as per your preference. Owing to a dual-wall design, the milk for the froth and the process of espresso making won’t interfere with one another at all. This amazing coffee maker is equipped with two filters, a frother jug, and a scoop so that you can easily initiate espresso making. When espresso starts dripping while the cup is not properly placed, the drip tray of this coffee machine would catch the drip. That means your counters are safe. After completing, you can quickly remove this drip tray to clean it easily. The Breville ESP8XL Café Roma filter would clog if the grinds aren’t ground to espresso-fine consistency. But, it’s not a very big issue. But, if you prefer to use regular coffee grounds, you need to invest a long time to unclog its filter. If you can cross this small hurdle, then you’ll get a treat of deliciously tasting espresso along with a nice crema on top. The coffee flavor entirely depends on the tampering process. But if you don’t tamper sufficiently, the espresso would become weak and I hope you don’t want to do that. Even though the design of this coffee maker is impressive, a problem is there with its steam rod. After turning this rod, it starts making unpleasant noise. Moreover, to make the foam, its steam pressure is not sufficiently high. It is a “no-frills” machine so you need to keep track of each and every fine detail while making espresso (like tampering). But, the effort would be paid off that can be witnessed from a delicious cup of coffee. The flavor of the Breville ESP8XL Café Roma is literally exceptional and the produced crema is just outstanding. So, if you don’t have any problem undergoing the tampering process, it would be an ideal espresso machine for you. Moreover, this coffee maker has come in a very affordable price structure. 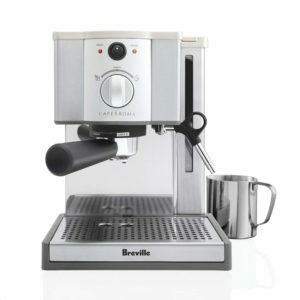 I hope the breville cafe roma review was useful for you and you’re now convinced enough to purchase it. If you’re searching for a home-use coffee machine, Breville Barista Express can be another alternative.